After the death of the Prophet, a man is called to lead his small religious sect as they anxiously await the end of the world they were promised. Director Joshua Overbay deftly leads audiences down a twisting path of passion and devotion, envy and manipulation in this sympathetic portrayal of a modern-day cult leader and his spiritual convictions. Devoted to a simple life of faith in unforgiving Kentucky backcountry, a small religious sect seeks spiritual awakening as their Prophet (John Lina) nears death and his son, Eamon (Luke Beavers), prepares to step forward as their new leader. But, in his last moments, the Prophet instead names newcomer David (Chris Nelson) as his spiritual successor. "cooks a surprising amount of tension from the barest minimum of ingredients." "coolly mesmerizing . . . devastating . . . a tale of desperate waiting and longing"
"gracefully shot . . . suspenseful and engaging." ". . . joins other recent cult studies in identifying the apocalyptic simmer that runs beneath current American culture. . ."
"has an Opie-gone-Jonestown look that gets freakier as the movie progresses . . .
a quietly compelling study of the last days of a religious cult veering toward madness and murder"
"takes [the] main character from the brilliance of enlightenment to the dark places where so many cult leaders end up"
"packs a surprising emotional wallop"
"captures a piece of the South without being disrespectful, inauthentic or dependent on cliches"
"an eerie, quiet dread . 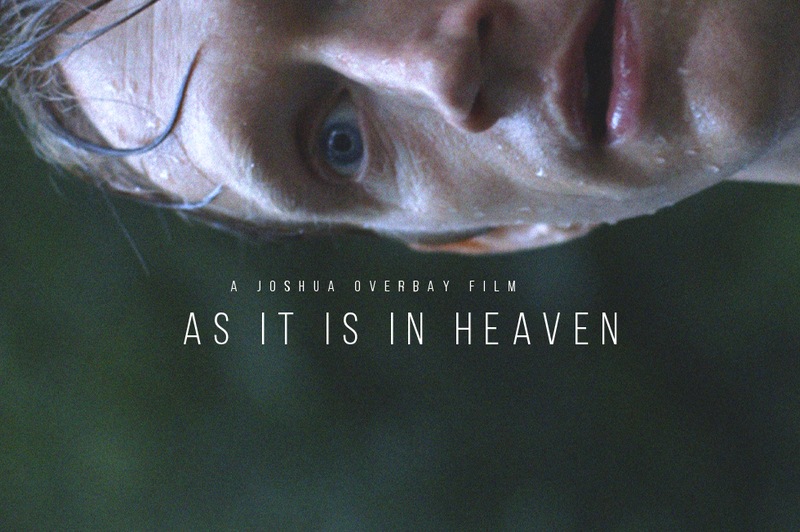 . . hangs over the film [and] stays with the viewer"
We've put As It Is in Heaven for sale worldwide, now, when purchased directly as a download or stream through asitisinheaventhemovie.com (i.e., not through Amazon, or Google, or Apple, etc). Pick it up right here! As It Is in Heaven - 99 cents on Google Play this week! Google Play has selected AS IT IS IN HEAVEN to be part of their 99 Cent Rental section this week! If you haven't seen the film yet through direct download, iTunes, dvd, or another way... here's a good chance. And if you have seen the movie, and liked it, maybe you can share this good news on your social media, writing about what the film means to you. We are live on digital networks across the U.S. and Canada. Joshua snapped the picture above from AT&T Uverse, and other friends have purchased from iTunes, Google Play, VUDU, and other spots! We're still rolling out onto Amazon and Sony Playstation, and some other networks, but we will be there soon. Look here for all the places we are or will be. Whatever way you see, or saw, the film -- would you write a review for it at imdb and / or on itunes? The more reviews from fans we have, the better ongoing placement we are likely to get. We hope you will also post such a review to any of your own social media, and perhaps email an endorsement to your friends. p.s. Christianity Today re-posted their great coverage, which also could work as something to share to your social media if you're up for it. We have amazing news. Thanks to your help, on February 3, As It Is in Heaven can be seen in homes across the U.S. and Canada. From February 3, 2015, on dozens of cable and digital platforms across the United States and Canada, you can watch our movie. 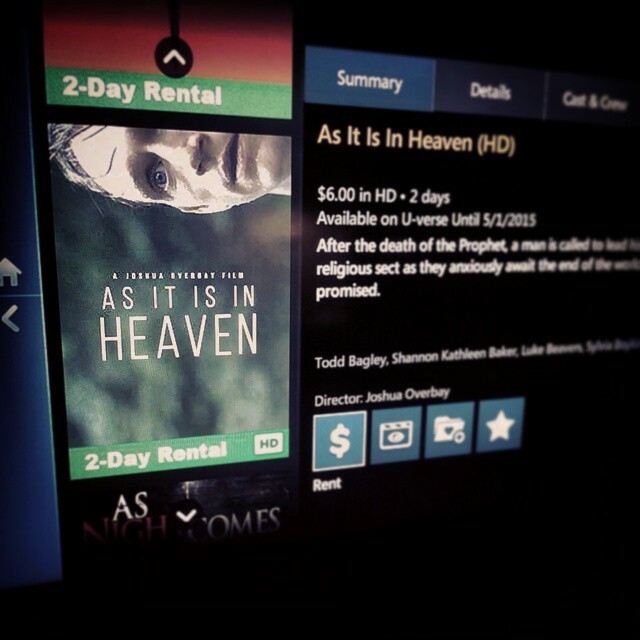 Watch through a direct download and stream at asitisinheaventhemovie.com, on Apple TV and iTunes (pre-order now! ), on Sony Playstation and Microsoft Xbox, and on cable suppliers including Dish Network, Cox, Charter, and many more (though unfortunately not Comcast or Time Warner). DVDs also sell right now through the website of someone who has been helping us out; they should arrive in time for February 3. On February 3, will you join us and watch the film, and then on February 4, post reviews on your own social media, on imdb, and in emails to some friends? If so, please RSVP to our Facebook event, and invite more people to join us. Those of you who requested DVDs as Kickstarter backers should receive before the street date. Everyone else, look at our website right now to pick your outlet of choice, including if you want by pre-ordering on iTunes, a stream and download from our website, or a DVD (which if you order now should arrive in time). If you are a subscriber to one of the cable networks listed, on the release date, you will look in the menus for new movies. Thank you so much for all your help this far. Join us for this last step. As It Is in Heaven finally comes home to Kentucky this week and next! Catch us RIGHT NOW in Lexington at the Kentucky Theatre, and next week in Louisville at the Village 8.